In November 1997 a team from Epiphone Guitars visited “The Dakota” in New York to examine John’s Casino. During the meticulous examination, countless measurements were taken, body tracings were done and all components of the guitar were photographed. As a result and in cooperation with Yoko Ono, Epiphone guitars proudly introduced the Limited Edition John Lennon “Revolution” 1965 Casinos. The “John Lennon 1965 Casino” is a reproduction of the guitar as John originally purchased it with the sunburst finish and stock hardware. The “John Lennon Revolution Casino” is a reproduction of the “stripped” guitar featuring one dull coat of lacquer, gold Grover tuners and the pickguard removed. A total of 1,965 of these individual hand-numbered historic instruments were produced. 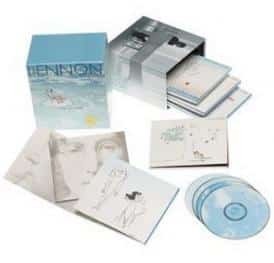 A portion of the proceeds from each sale was donated to “The BMI Foundation, Inc. for John Lennon Scholarship fund” which supports music education. The Casino has a heritage as fascinating as the man whose name it bears. 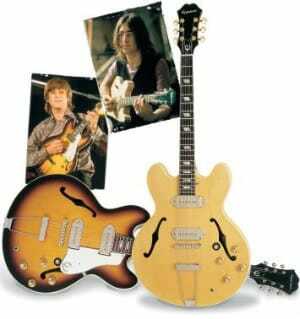 In 1966, during the recording of Revolver, John Lennon and George Harrison acquired sunburst Epiphone Casino guitars. 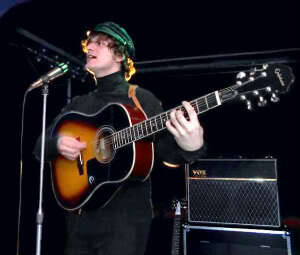 John was taken by his new guitar and made it his main axe from that point on, using several different versions over the ensuing years. In cooperation with Yoko Ono, Epiphone introduces 2 Limited Edition Lennon Casino guitars. The ’65 Casino is a reproduction of the original guitar John purchased with its sunburst finish and stock hardware. In 1968, John had his Casino sanded down to bare wood and finished with a thin, dull coat of lacquer. He first used this “natural” Casino in “The White Album” sessions of ’68. The John Lennon Revolution Casino is a reproduction of this stripped guitar as it remains today, featuring one coat of lacquer, gold Grover tuners, and the pickguard removed. A combined total of 1,965 of these individually hand-numbered, historic guitars have been produced, and a portion of the proceeds from the sale of each goes to the BMI Foundation for the John Lennon Scholarship Fund which supports music education. Limited lifetime warranty. 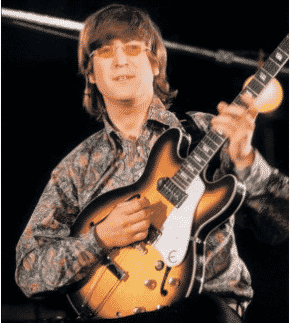 Epiphone includes a hardshell case with the ’65 John Lennon Casino Electric Guitar. I have an Epi John Lennon’65 Casino and a John Lennon EJ-160-E the Casino has become my most cherished guitar,the sound is identical to John’s original when played through my Vox amps and it has the best action of any guitar I’ve played.The workmanship on the J.L. is flawless and the woodgrain is beautiful,the guitar just sings like no other.On songs like”Don’t Let Me Down”and”Dig a Pony”the tone is so true to the original,it’s uncanny.The EJ160E is also a great guitar and sound and quality are just as good or better than a lot of guitars costing much more.The acoustic tone is loud and bright and when you play it plugged in the P90s give it the true Beatle sound especially on a song like”I Feel Fine”.The action is also close with no string buzz.Both guitars are well worth the investment especially if you’re a Beatlephile.